Mascot, generally spelled miserly, went whole hog from time to time, as with this special done to evoke memory of Hell's Angels, from which it borrowed aerial footage and lead man Ben Lyon. 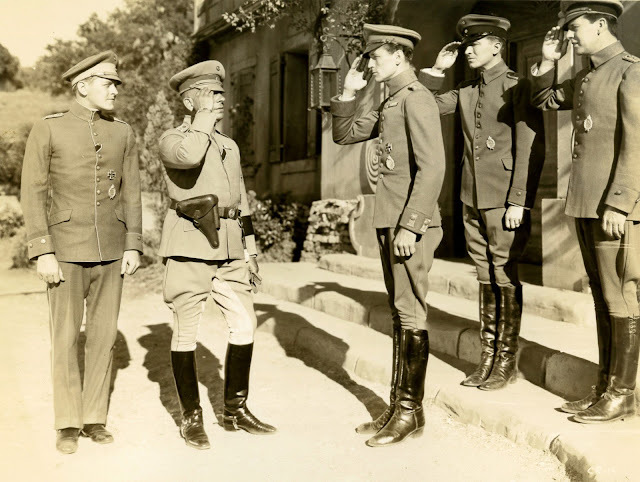 He's an American who enlists with German air service in solidarity with a lifelong pal branded disloyal for teuton origin, this just ahead of US war declaration in 1917. 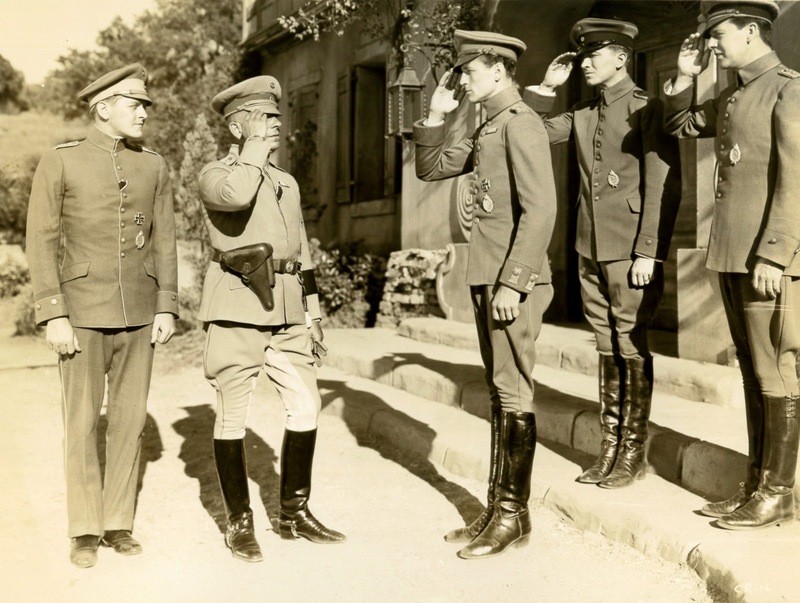 Squad command is Erich von Stroheim, as in otherwise why watch? Someone put most of Crimson Romance at You Tube, where quality compensates for parts missing. We think of Mascot, if at all, as purveyor of serials. This was lick at larger markets. Wish I knew how well, or not, it succeeded. Hell's Angels cast a long shadow, not only with content, but flying thrills that Howard Hughes let go to whoever henceforth would pay for its use. That stuff, spectacular as ever, turned up in B's both independent and studio-made for years to come. Did Hughes just not care? --- or was staff peddling action bumps without the busy tycoon's knowing? Never mind, as it is Stroheim we are here for, even in reduced circumstance where it seems there is never enough of him. Everyone else shrinks to mice when he enters the scene. To think he was so busted within a year that chums at MGM were collecting charity for him. Triumph of Grande Illusion was a rescue, then Hun-casting with a new war paid early 40's rent, but they'd not let EvS direct again, many times bitten, forever shy being policy writ in stone by studios. I listened again to his radio tribute when Griffith died, also on You Tube. That voice, cadence, emphasis, everything. No actor on earth was like Von. Wish we could see more of his Euro thrillers. Stills from each look suitably bizarre --- you'd hope he had plenty to do creatively with them. Still Scary After All These Years? Gone over at length before, but fascination continues and is enhanced by Region Two release of Blu-Ray in both US and Italian versions. Mix/match these and you'll get a most satisfying so far Sabbath, but assemble with caution, as there are pieces to avoid. 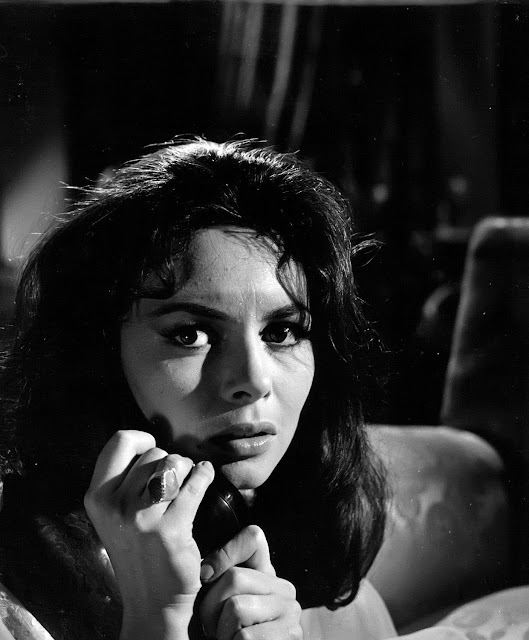 First The Telephone, a dud among three tales in this omnibus, but take the Italian's call if you must, as it retains lesbian subtext snipped when Jim/Sam brought Black Sabbath ashore for AIP release. The Telephone might be called a spaghetti Twilight Zone, staged all in one apartment and distinctly punk beside gothic companions. I dropped it altogether for a college run in 1975, tightening Black Sabbath to featurette length as campus combo with Brides Of Dracula. Scariest stuff by most accounts, that is, those lucky enough to have seen Black Sabbath in theatrical-1964, was The Drop Of Water and its hag of a revived corpse seeking payback for a stolen ring. Aaargh, that face ... and never mind that modern viewers are likelier to laugh ... we who remember still revere it. 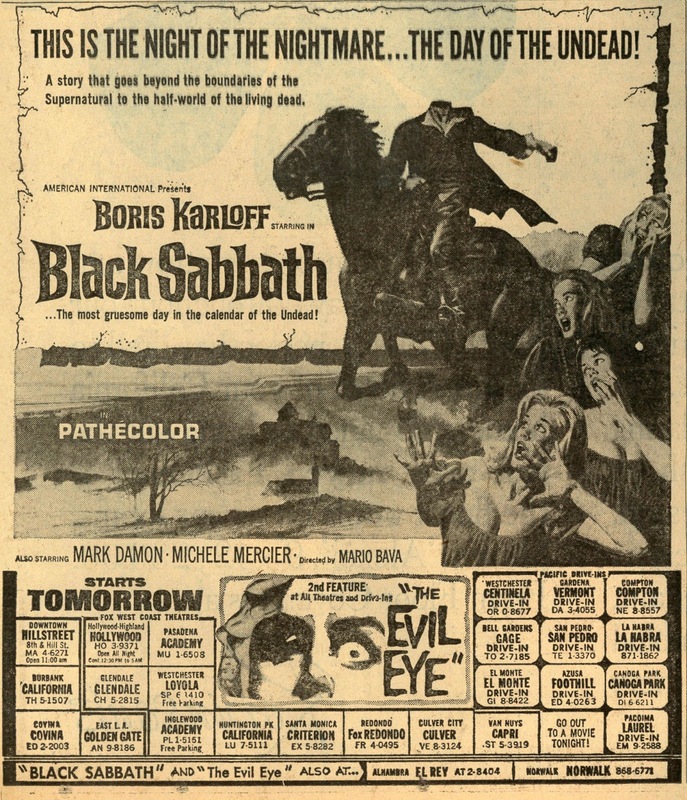 The Karloff section was held for Sabbath's sock finish. Here was BK playing sinister in his seventies, a triumph of charisma over age, him still the scariest monster for kid-dom whether at matinees or midnights on the tube. Longest-serve The Wurdalak put Boris to bloodsucking and brandishing heads he'd hang as yard ornaments, a gleeful prospect for all us who thought him too tame in Thriller episodes. In fact, it was Thriller Jim/Sam wanted to evoke by having Karloff introduce each of the tales with tongue-in-cheek after TV example. He'd done as much for the Italians, but those intros were too far-out even for AIP, and since Boris had a contract with the firm, it was thought better to bring him over here to shoot fresh ones. 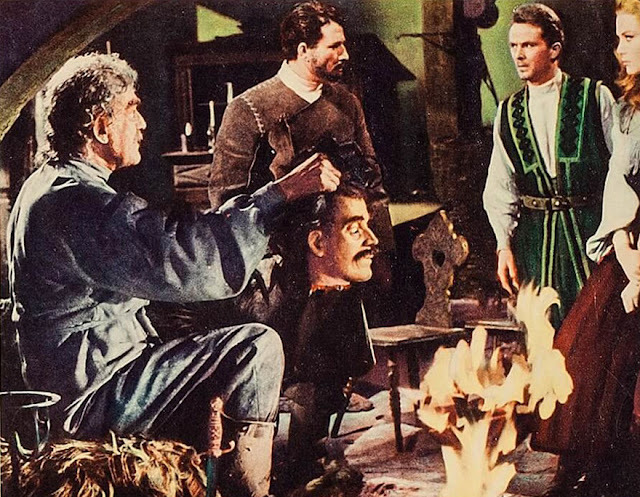 What wounds the Italian Black Sabbath (called I tre volti della paura, or The Three Faces Of Fear) is Karloff's voice dubbed to their language. That's worth hearing once for curiosity, plus there's more gore (the head) and as with all three sections, different music which some prefer. For sentiment accrued from seeing Black Sabbath first-run, give me, for a most part, AIP's version, altered though it may be. 69 hummer minutes from Metro's B unit, still out-putting in 1953, but soon to fold in deference to widened image and longer runs. It would henceforth be less about volume and more about laser turned on handful of big pictures aimed at far fences. 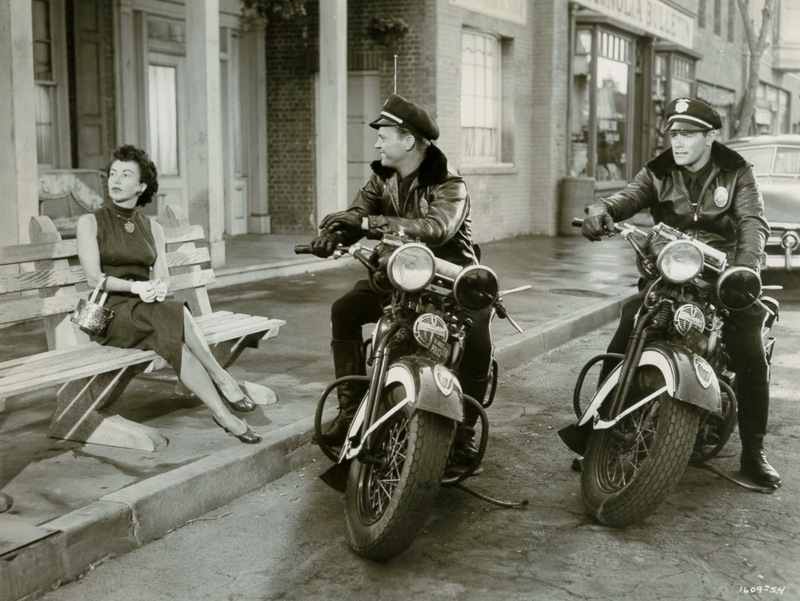 Studio chief Dore Schary put economies in motion from 1948 arrival, result humble pleasures like Code Two, which served well those still tolerant of black and white square screens. 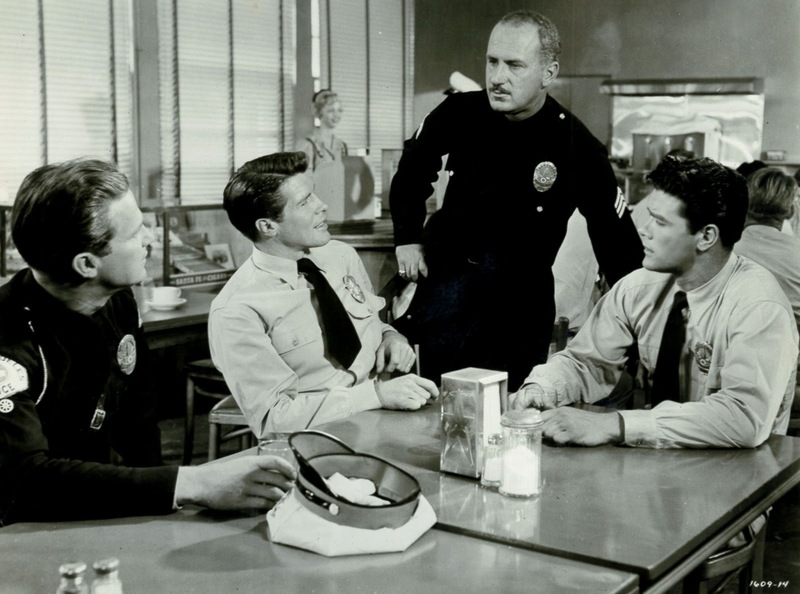 Code Two's first half is near-docu recount of training for LA police recruits, noir flavor saved for latter portions where modern-day cattle rustlers (!) add cop killing to their resumes. 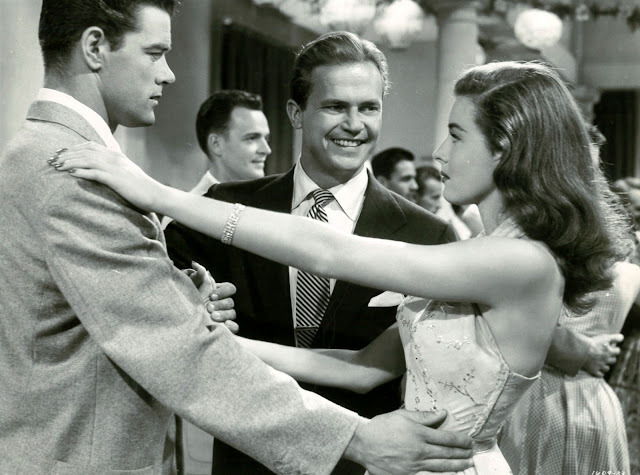 A young cast was maybe hopeful of MGM stardom as bestowed in earlier day: Ralph Meeker (a hot dog patrolman who learns modesty), Elaine Stewart (that Bad and Beautiful girl, still beautiful but this time not bad), Robert Horton (greater success to come w/TV), Jeff Richards, an unbilled Chuck Connors. MGM was good at gritty when done on budgets (Code Two negative cost but $472K). Deuce of it was patronage staying home to watch Dragnet, Racket Squad, and others of similar ilk on free-vees. Result: Code Two lost money, not enough to cost meals, but sufficient to scotch many more such B-joys from Leo. To the Dragnet link, I'm guessing that hot series was much of Code Two's reason for being. The feature turned ignition (start date 9/15/52 on location at L.A.'s Police Academy) right when Dragnet was kicking off a second season. 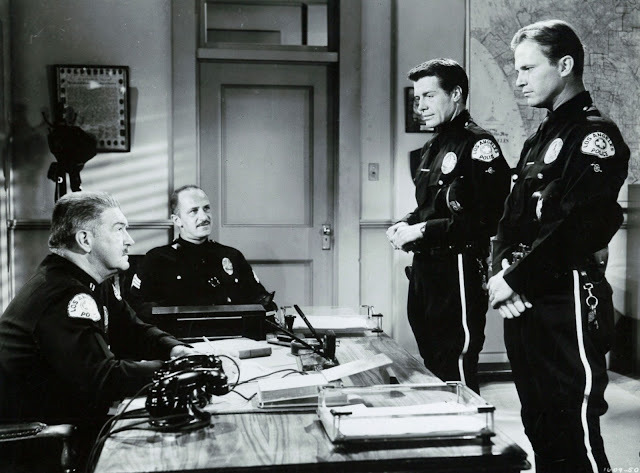 Variety was high on Dragnet ("one of the smoothest, classiest telepix packages on the air"), cool to chilly on eventual Code Two, which wasn't wrapped and released till 3/53. The trade thought it "an obvious B," and "strictly a filler for the less-demanding situations," this stating the obvious as Metro had no designs for it beyond this. We can see the appraisal as harsh for reason that press/public took brisk and expert melodramas very much for granted then, there were so many after all, and they'd not see this for sunshine trip-back to L.A. before smog-dappled fall. 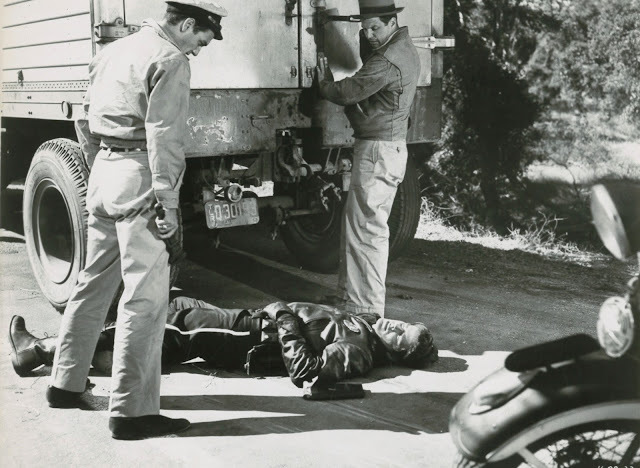 Crooks were about, some deadly, but so were shiny motorcycles with black-clad officers, barbecue pits on days off, and overall reassure that L.A.'s force has the spread-out town reasonably under control. Code Two would make a fun and eye-opener double bill with L.A. Confidential. Cops cooperated, as this was positive depict after Dragnet model. No corruption or badges on the take as was endemic to police thrillers of a same season. Code Two would fit comfortably behind other Metros with higher hope: Small Town Girl, Battle Circus, The Girl Who Had Everything. It was designed as a second feature like hundreds of others back to the thirties when combo policy was embedded. Code Two served as backdrop to loaded vaudeville programs (there still were those in the 50's), as in Miami where it supported "recording click" Sunny Gale, the "thrush" and "attractive lass" who had scored a Hit Parade berth with Wheel Of Fortune, though Kay Starr made a bigger success covering the tune. There were also roller skaters, a Cuban band, magic that was tough to register on a cavernous stage, plus a comic plying "waggery," even if Variety thought "much of his routine ... stale." If vaudeville was dead, these folks didn't know it. Eternal feud between distribution and exhibition got April '53 airing with Code Two as pawn, MGM dropping ad support to the United Artists theatre circuit in L.A. because latter wasn't kicking in their share of expenses. How much you'd invest on promotion could absolutely determine end-game profit. Spend too much tooting horns and drown in the red pool, no matter your crowds surging in. For this instance, Leo simply cut off the spigot and left UA to ad-buy for Small Town Girl and Code Two with its own dime, and as the circuit had only $2,500 for a weekly ad budget, this was lowering boom on their operating week. When Metro and other majors spanked, they spanked hard. Could This One Have Brought Jack Back? 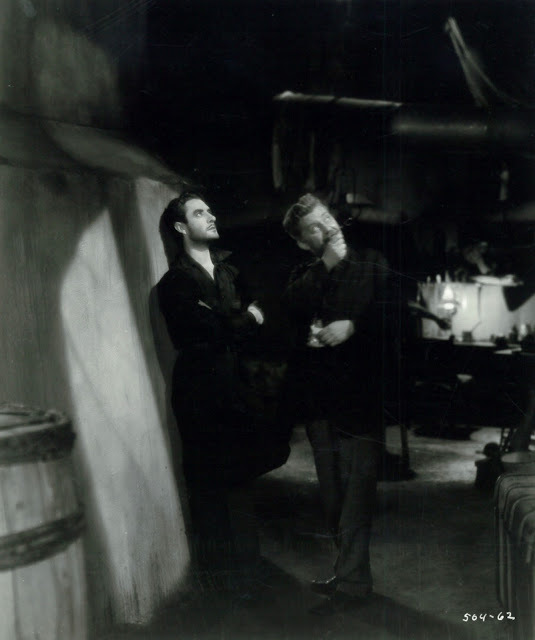 Plenty of star dust clung to John Gilbert as he ventured into talkies, evidenced by dual-role-ing here, Jack as escape artist who beats a murder sentence to pose as the killed man and place guilt where it belongs. The opener reel grabs: Gilbert wriggling way from a water trap like one that had doomed real-life Houdini, then besting gendarme Lewis Stone at handcuffs. You'd like to think The Phantom Of Paris would bring Jack back, hopeful trade ads having pointed to each of his and said this one's the charm, but no, all of Gilberts after His Glorious Night lost money except Queen Christina, which was, of course, more a "Garbo" than a "Gilbert." JG does tricks with his voice to effect assumed identity, a conceit admittedly hard to accept as the face is identical but for raffish goatee. Anyway, it scuttled (or should have) doubts of Jack's ability to talk with variety and conviction. If Chaney could make sound success of The Unholy Three, why not The Phantom Of Paris for Gilbert? Oh well, I'd have suspended disbelief in 1931 just as I did in 2016. There's still no talking me into notion that MGM was sabotaging Gilbert with pictures deliberately bad. 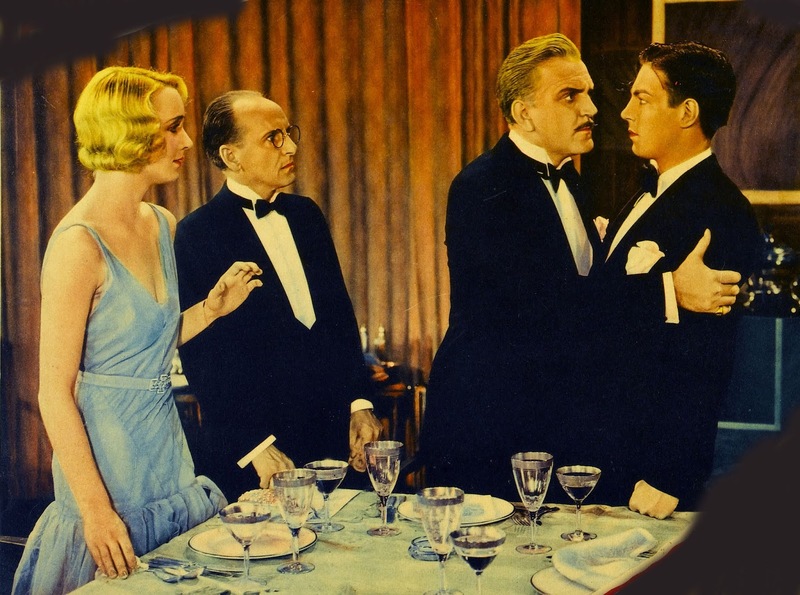 If you look at what Leo handed Ramon Novarro, William Haines, and Buster Keaton in a same year, The Phantom Of Paris looks Citizen Kane-ish. No use trying to figure why Gilbert sunk so utterly; we'd have to know a public's mood circa early-30's better than is possible at 85 year distance. 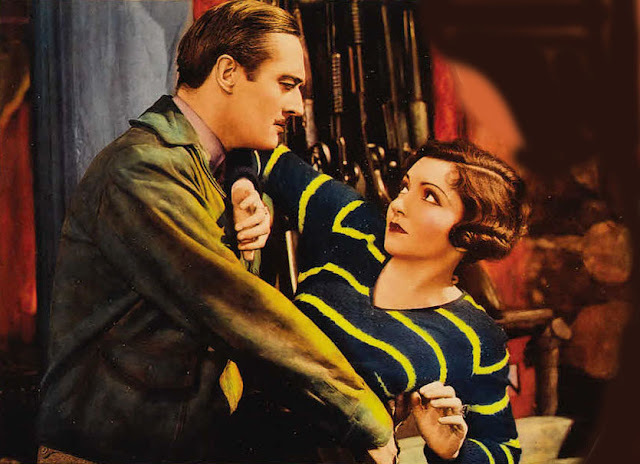 A question occurs to me, then: How many John Gilbert fans stayed loyal after slippage began? Has anyone seen vintage scrapbooks representing his talkie period? There were/are always ones to champion an underdog. I'd like knowing how much fan mail Jack received around Phantom's time. Did he ever read letters for reassurance, or present them to execs as evidence that some still cared? Whatever --- the numbers spoke loudest, and they were writ in red. 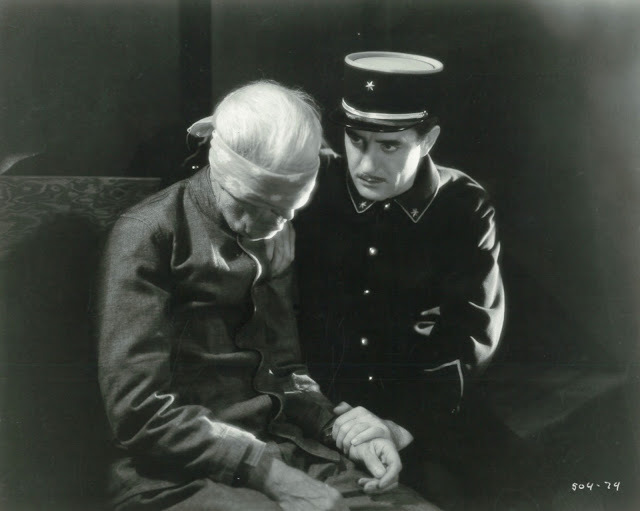 No matter how much we enjoy The Phantom Of Paris, Downstairs, and even saucy pre-code Fast Workers, there was just no surviving such relentless rentals loss. Hollywood, as with much of business, government, and any number of other powerful institutions, had a "Don't Do As We Do, Do As We Say" policy. Movies were in virtually no way a reflection of real life. Ideals of behavior, seldom applied by members of the audience, saw Happy Endings in terms of sacrifice laid down where moral good was best served. There was, for example, no way Casablanca could end other than how it did. 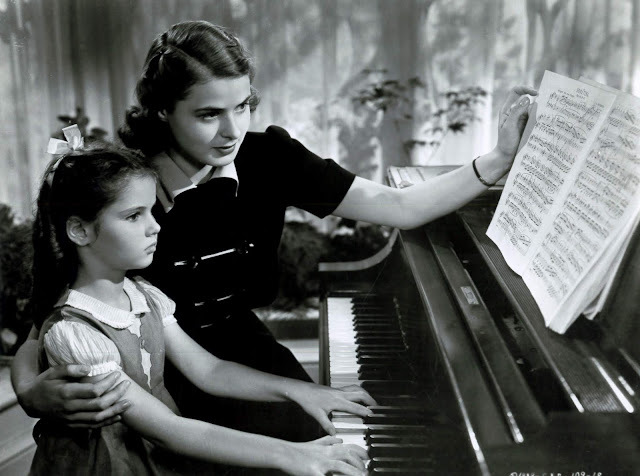 What percent of actual men would forfeit Ingrid Bergman to furtherance of a cause, and incidentally, a husband she has expressed every desire to leave? Movies were always for virtue signaling, and I wonder how many Classic Era viewers confused that with daily struggle that made them oft-do un-virtuous things. Was it enough to at least recognize a difference between right and wrong, admiring films for good example they set and hoping that perhaps others would be influenced by them. Virtue signaling is defined as "the action or practice of publicly expressing opinions or sentiments intended to demonstrate one's good character or the moral correctness of one's position on a particular issue." This neatly sums up terms of the Production Code under which Intermezzo was produced in 1939, and never mind that the artists involved were anything but adherents to it insofar as their own brakes-off private lives. Intermezzo has a line that crops up sure as sunrise in every old film about adultery: "It's hard to derive happiness from the unhappiness of others." If only we all lived by that precept, but how many do when real temptation is put before them? Lives and marriages get routinely wrecked because someone strays, but what of Hollywood stars and producers rich or powerful enough to insulate themselves against consequence for bad acts? They can, have, and continue, to thrive lifetimes. 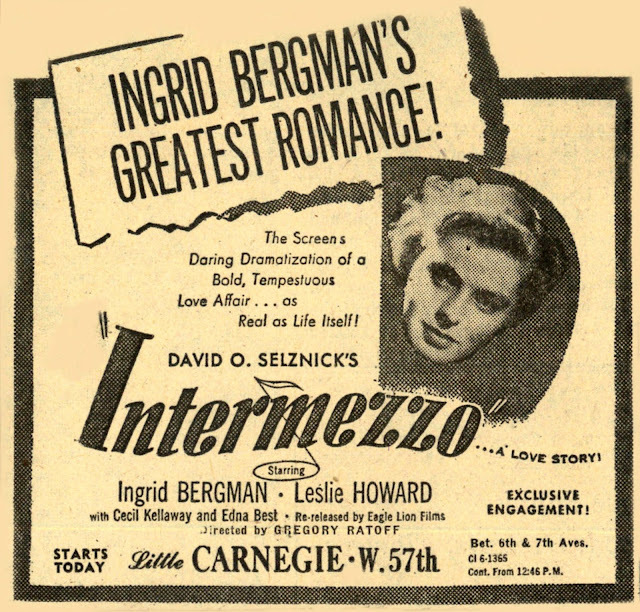 David Selznick knew the right-think message to plug onto Intermezzo, but did he live by its ennobling theme? Not for a minute. 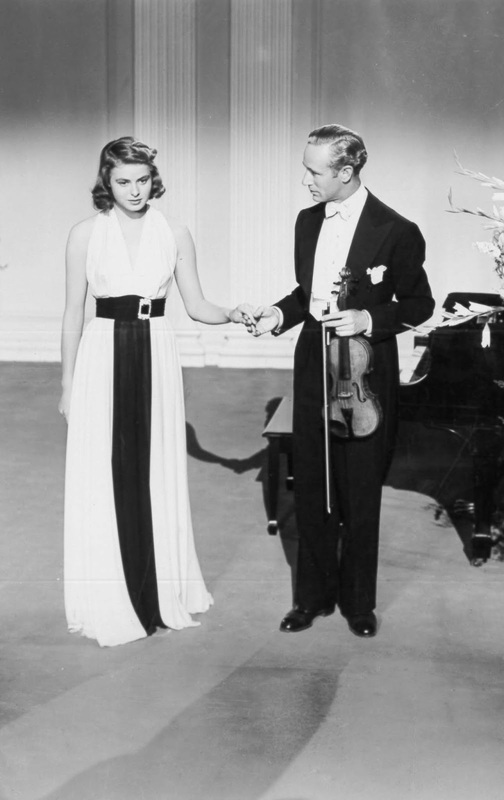 DOS had a wife and two children at home, but he went after newcomer Ingrid Bergman like white on rice. His "associate producer" and star Leslie Howard torments over the affair he indulges as concert violinist "Holger Brandt," and will indeed return at the end of Intermezzo to the wife and two children he left, but Howard, who had his own wife and two children, kept a separate life for himself, and mistresses by bushel, one of which, Merle Oberon, he introduced to his daughter as "your future step-mother." Howard's offscreen romances weren't slowed by discretion, and it was for his wife to make peace with them for a whole of their life together. Leslie Howard's saga and habits are revealed in a new documentary TCM ran during its month devoted to the actor. Whatever the reality of his own pursuits, Howard could play guilt over infidelity to the nines. He was a persona star for which the persona seems narrow today, but within that range, he had no equal. Howard's was a passivity to which women were drawn, onscreen and off. He's more maligned than not by the character of Ashley Wilkes for which he is by far best known, the role wholly anathema to him despite its being a principal in the most famous picture Hollywood had made to that point. If not for Gone With The Wind, Howard's name would be barely known, premature death in 1943 making him seem the more remote to modern viewership. 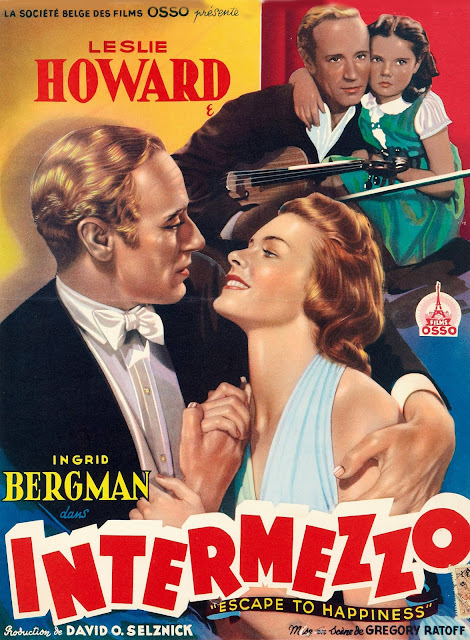 Intermezzo's Holger Brandt is much more congenial to the Howard image, and he looks better in black-and-white than Technicolor. As line producer, Howard had creative input to likely account for quality of the finished Intermezzo, for it seems less likely that credited director Gregory Ratoff brought such result off. 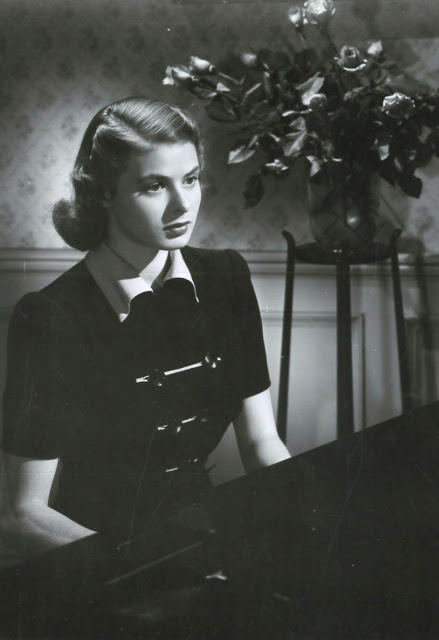 Ingrid Bergman as the luminous new face would command interest then, and afterward. Intermezzo is too brief at 70 minutes to sag under weight of expected outcome. It is among great emotional wringers from the late 30's. Kino offers a very nice Blu-Ray as part of their Selznick line. Universal's Vault has just released a number of early 30's titles to DVD. Buying any of their product amounts to dice throw for equal chance you'll get something nice, or a pack of dogs. Quality may vary from fresh transfers (White Woman) to wretchedly outdated ones (Kitty). I'm pleased to report that this latest group, at least four I've seen, bats a thousand. These are for most part Paramount titles that haven't been accessible other than on bootleg discs, the films largely unknown because so few have had opportunity to see them. I won't argue for any as undiscovered classics, but all are curiosities worth a sit through short lengths (none over 75 minutes), and again --- the quality is excellent. Two feature Claudette Colbert, one has Carole Lombard and Miriam Hopkins, the trio falling in category of "pre-code" even if little happens to exploit greater license movies had before enforcement got tight. Just seeing them --- all for a first time to mine eyes at least --- was plenty fun and happy deliverance from fuzzy dupes-off-dupes the lot of so many vintage Paramounts. Vault releases tend to be a well-kept secret, word out through fan forums and no where else, it seems. Mine came from Amazon and got here fast. The dip included Honor Among Lovers, The Misleading Lady, Fast and Loose, and one from the 50's by Universal-International, Six Bridges To Cross. That last wasn't even mentioned by forums, it being stumbled across quite by chance at Amazon. Makes me wonder what else might be available that I'm not aware of. 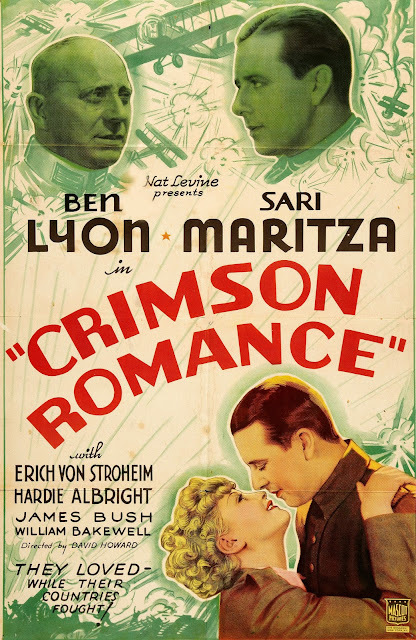 Honor Among Lovers is a 1930 release directed by Dorothy Arzner. 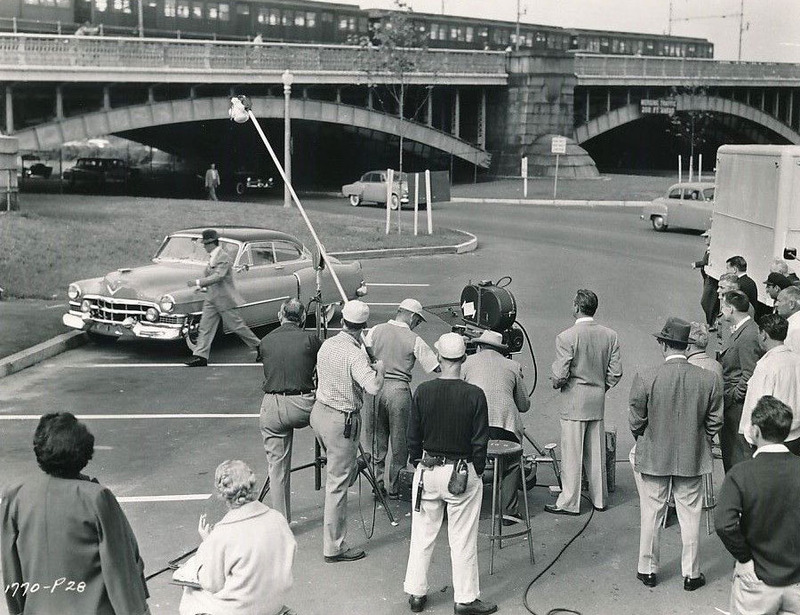 It was filmed at Paramount's Astoria plant, a veritable "Hollywood On The Hudson," per title of Richard Koszarski's outstanding history of New York-based filmmaking during the late silent and early talkie period. Box art for the Honor Among Lovers DVD indicates Pat O' Brien among the cast, but he's not in it. However, Monroe Owsley is. 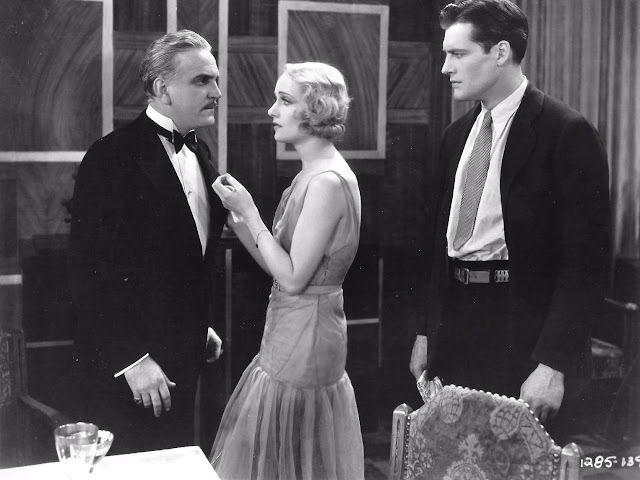 Fredric March in straightforward lead-man mode sports a mustache that looks clipped on, like what W.C. Fields wore in his silent features, and every bit as unappealing. 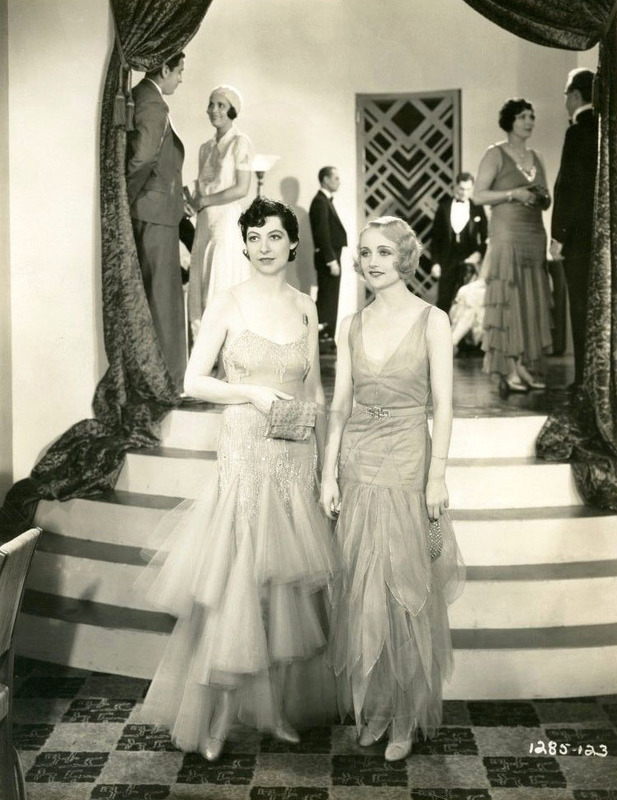 March is a business tycoon on the make for secretary Claudette Colbert. She marries Owsley, that telegraphed early on as a big mistake. You could have stepped into the lobby for ten minutes of smokes and not missed much of this one. Moments are engaging because these players make them so. 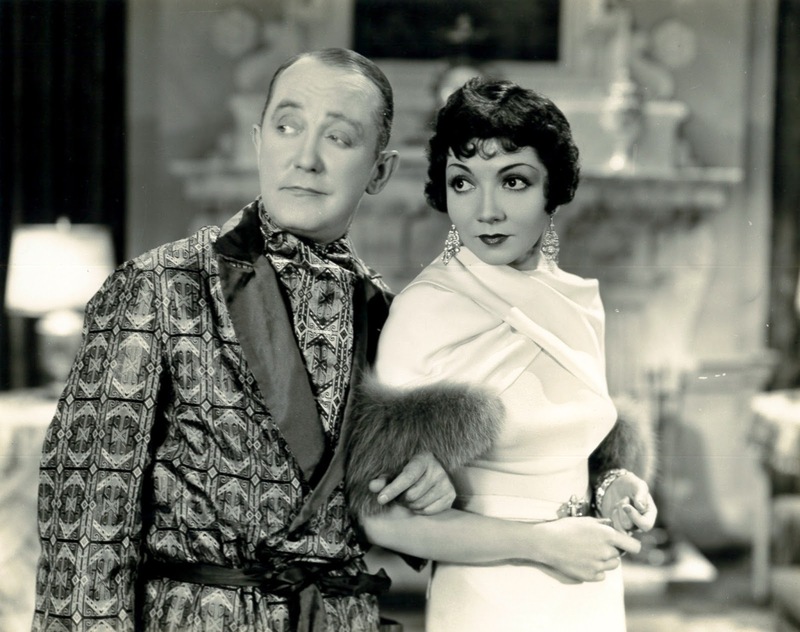 Charlie Ruggles is a raccoon-coat-clad tippler with Ginger Rogers as his birdbrain GF. Hopes for something unexpected to happen go unfulfilled, but there are roadhouses, posh apartments, and night clubs all circa 1930, that being enough (or should be) for viewers who gravitate to such antiquity. Fast and Loose was Miriam Hopkins' first feature with sound, to which she brings the Georgia accent and playing that would single her out among peers. Hopkins had an offbeat quality. You never knew which way she'd twitch. Co-workers found her unpredictable, as in troublesome at times, but this actress can make an otherwise flat vehicle worth seeing, as here. Survival among players fresh to talkies was for the fittest. Few got much help from writing or direction, as everyone was treading water and desperate to stay above the surface. We see sample of that in young Charles Starrett, who actually swims into a first camera view, Fast and Loose also shot at Astoria, which would ordinarily limit movement, but variety is got this time via beach scenes done at Manhasset Bay, a plus for sound and location in early tandem. In distinct Fast and Loose support is Carole Lombard, shaded by Ilka Chase, who is frankly funnier in her part than Lombard would ever become. Watch this and marvel at how much Lombard improved in a next several years. Preston Sturges did some writing on Fast and Loose, Ilka Chase a seeming comic mouthpiece for him. The whole movie should have been about her adventures, rather than Hopkins or Lombard. 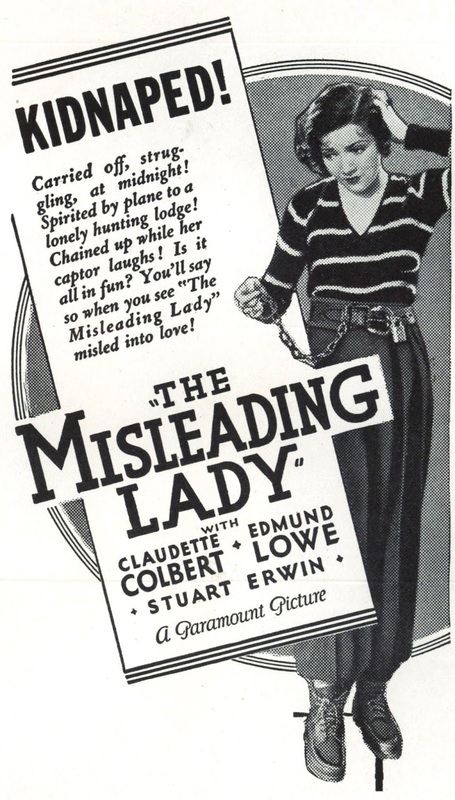 The Misleading Lady misled me for a first act that was pretty good, but then Edmund Lowe kidnaps Claudette Colbert (for making him out a fool in front of society friends) and then, heaven sustain us, in walks Stuart Erwin to do excruciating shtick to make me wonder how senses of humor could change so drastically since 1932. Lowe wouldn't get crowd approval today for chaining Claudette like a zoo animal, but what's that but wacky fun of then-films unplugged. To note with The Misleading Lady and Honor Among Lovers is how effective Colbert always was, even (perhaps especially) with weak material. Her line readings are never rote, each line getting a twist I'd not expect any other actress to lend. Colbert learned French first --- she grew up there --- but got the most of any actress from English phrasing and inflection. Look, and more so, listen, when watching her a next time. I suspected The Misleading Lady was based on a play and sure enough, it was (a "farce," in fact). Why did escaped lunatics amuse people so in the early 30's? A real odd duck of a forgotten programmer. 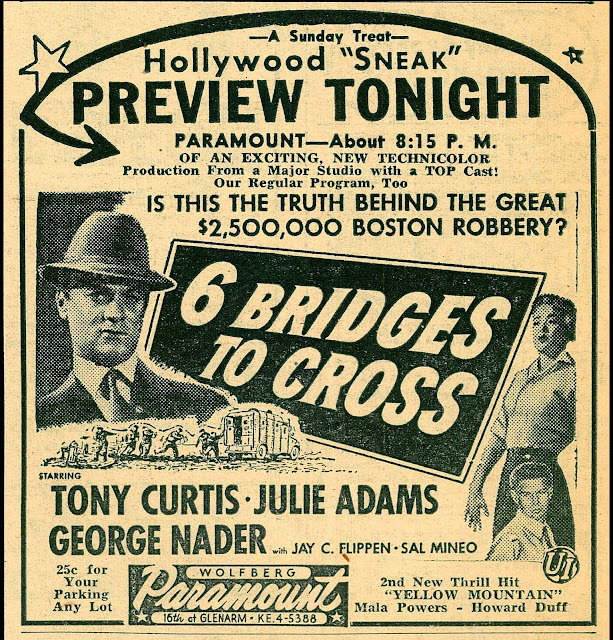 The fourth and final of my Vault tour was Six Bridges To Cross, a U-I crime drama happily done on location in Boston "where it happened" (an armored car robbery), and here's a bonus: the disc is anamorphic 1.85 and looks fine. That last was welcome and unexpected. Six Bridges To Cross has also been a tough title to track down. Universal spent to make it major, Tony Curtis established by then with A's and George Nader a name in development. 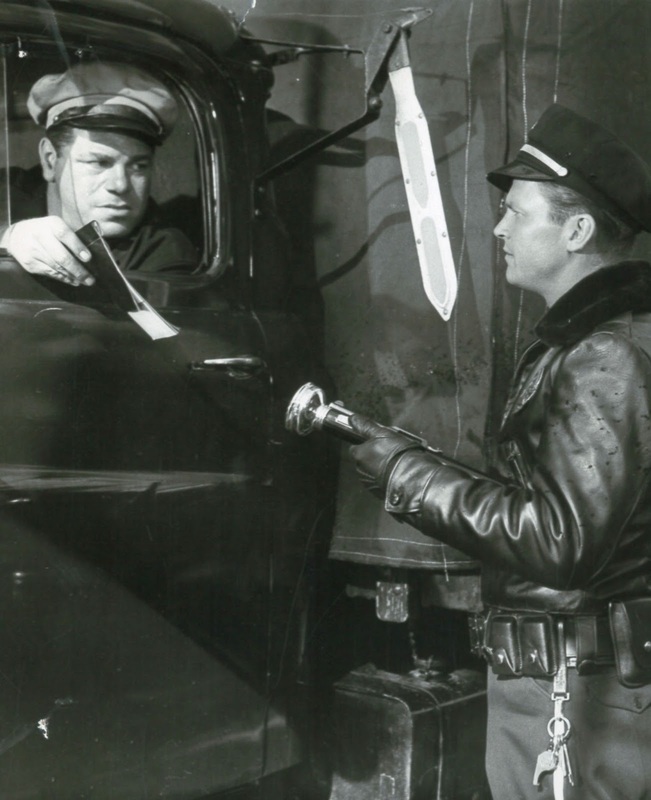 Too bad he had to fall on the Confidential sword meant for Rock Hudson, though Rock would return the kindness by remembering Nader in his will. 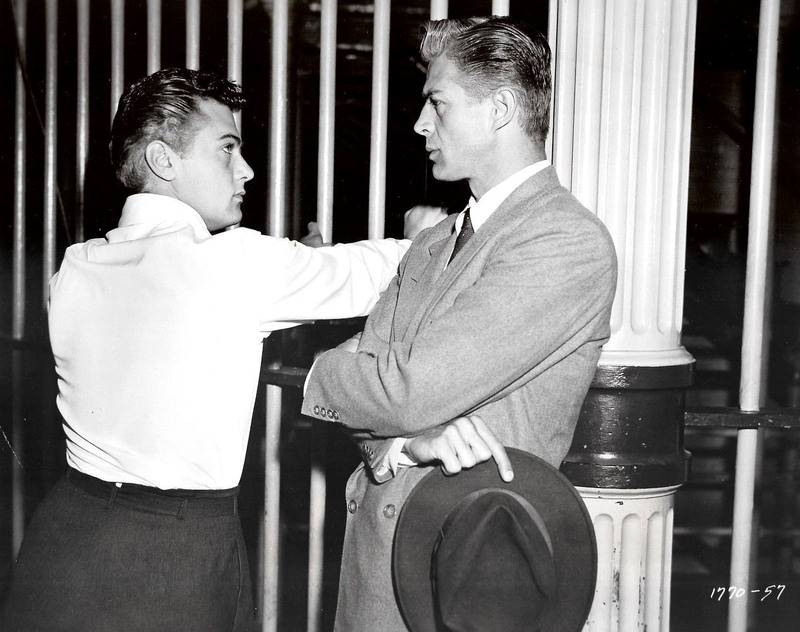 Sal Mineo has his first feature part playing Tony Curtis as adolescent J.D. Street scenes are crowded, for real, and have conviction. Both Curtis and Nader are excellent. Six Bridges To Cross dispels conception of Universal-International as cheapie begetter. Too bad there are aren't more of theirs out there to rediscover. 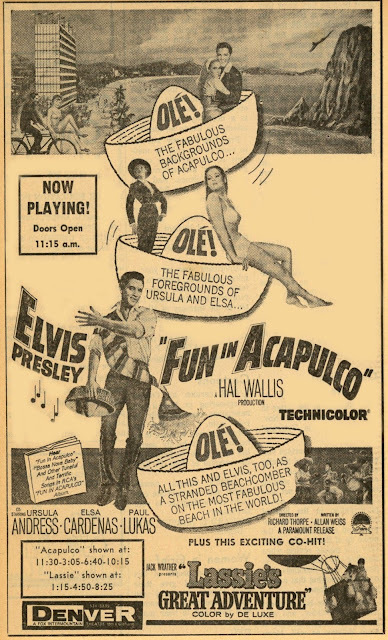 Acapulco Holiday For Elvis Stand-Ins! What Better Combo Than Elvis and Lassie? Elvis Presley must overcome fear of heights so that his double may dive off the highest cliff in Acapulco. That and all other exteriors had to do without Elvis, who was loathe to plane-travel and so scorned the trip south. His stand-in is stunningly evident on High-Def rendition of Fun In Acapulco. 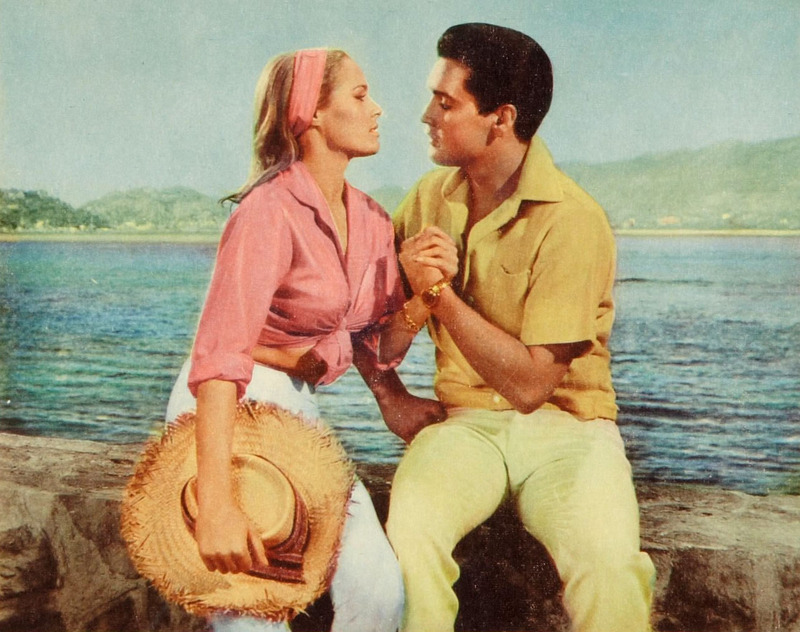 Old Technicolor prints, rich and saturated as they were, did not tip the hand of faux Elvis taking up position every time cameras ventured outdoors. Scenery was a plus in Presley pics, especially those Hal Wallis produced, his certainly the most handsome of Presley's lot. In this instance, a second unit flew down for the balmy stuff --- hotels, cliff sites, all we expect of Acapulco --- while the first team, with principal cast, shoots the rest at Paramount facilities. To simulate his presence in Acapulco, Elvis literally spends half the pic before process screens. By 1963, he'd been lacquered into submission, his hair not shifting a thread however winds blew. These sceneics saw their star doing songs and most acting by rote. I wonder if he even glanced at dialogue before walking on a set (might Elvis be more engaged had he traveled to exotic settings?). His southernisms make selves felt --- he refers to "Co' Cola" rather than scripted Coca-Cola at one point, a distinctly Dixie enunciation I've heard (in fact, used) all my life. Fun In Acapulco and others of the Wallis/Presley line look particularly nice in HD, reborn in the format, and a pleasure to close-inspect for means by which backgrounds were mated with players emoting thousands of miles distant. 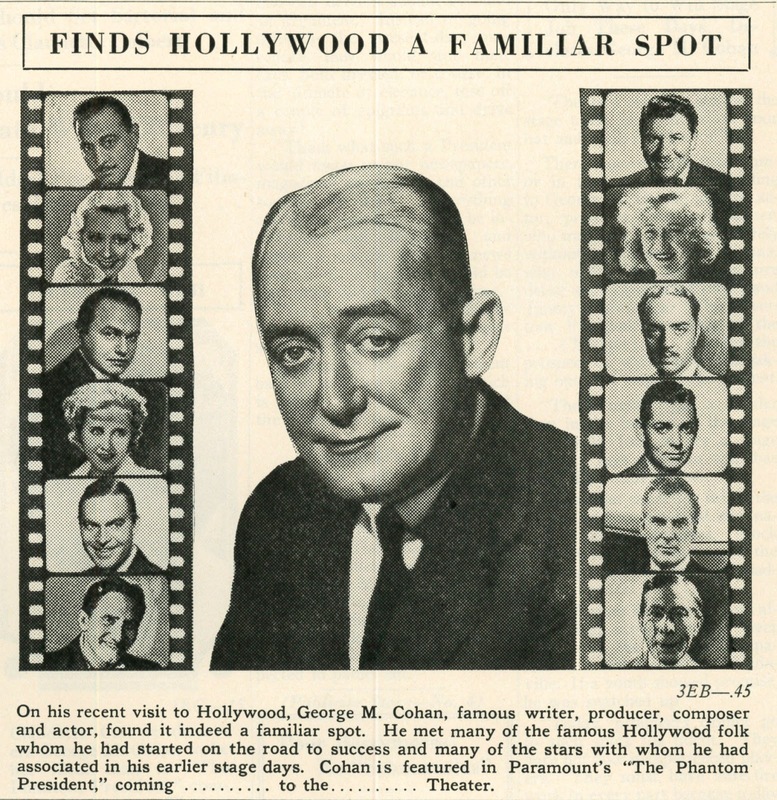 Getting George M. Cohan for talkies was heady stuff. He had starred in, produced, or otherwise ram-rodded 140 plays, written 500 songs, "all hits," said breathless press, and made a million off Over There, America's anthem of the Great War. Cohan swept into Paramount with a multi-pic contract, was figured to do everything save perk the coffee and sweep off stages, a miracle-making jack of all talents. Cohan summit on Broadway was passed, but who knew but what he could recharge his battery with movies? Cohan didn't look the screen star type, but fast feet and quicker patter seemed a recipe for films arrived lately at sound. Jolson after all came of a same source, but 1932 wasn't 1927-28, and musicals had besides gone dim at turnstiles, as had Jolson. Would anyone remember Cohan minus Cagney's later immortalization of him? 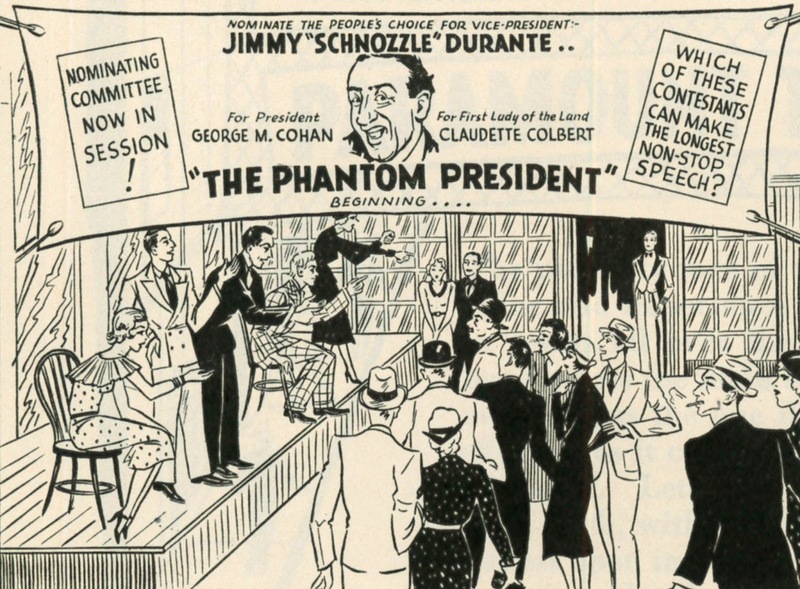 I admit to watching The Phantom President for compare of real and reel Cohan, thoughts fixed on how close Jim approximated George M. Turns out dance styling of Yankee Doodle Dandy took many leafs from Cohan book, or at least Cohan as he might have been at peak of athleticism on stage. Both Cohan and Cagney walk the stage walls, or bounce off them, one of Yankee Doodle's big takeaways. 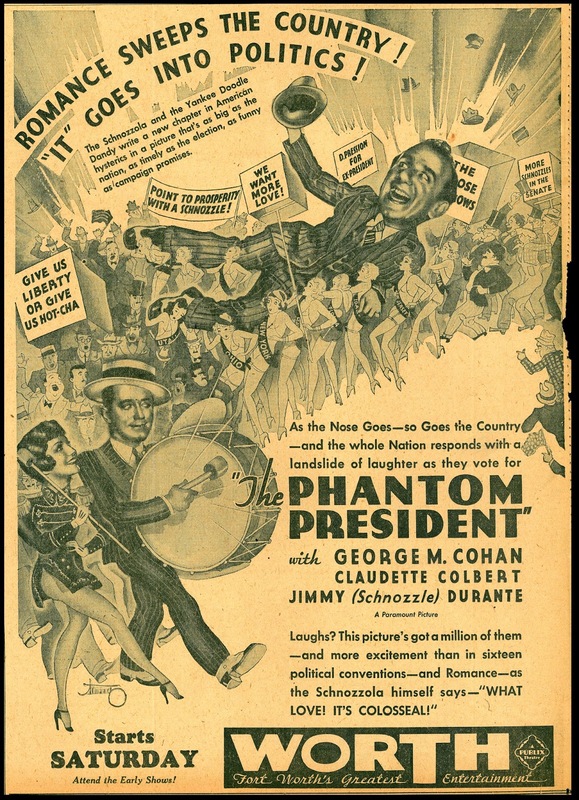 Age-wise there was difference --- about ten years when Cohan and Cagney did their respective turns, GMC at 53 for The Phantom President, JC a decade younger when he did Yankee Doodle Dandy. Cohan enacts a dual role in The Phantom President, but still gets crowded off by Jimmy Durante, the "Schnozzle" riding a crest of freak popularity fed by Paramount here, also Metro in a series Durante stole from Buster Keaton. Most view him now as an irritant, at least to primacy we'd give Cohan/Keaton, but ads reveal Jimmy driving ticket sales thanks to freshness he brought to comedy drunk on non-stop talk. Did Durante exhaust 1932 patronage as he does us? Maybe not, for again, he was something brand new to farcing, like a joke or a song that catches fire and burns bright until listeners tire of it. 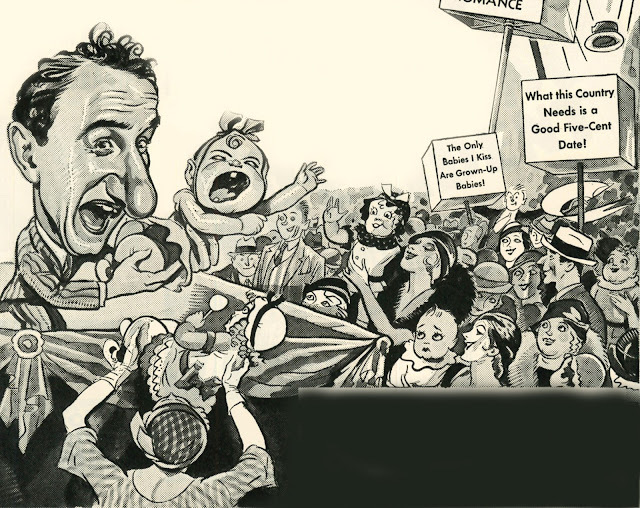 Durante would last, without even having to vary his routine, but by time of reemergence as character or comic support, handlers and a public, if not Jimmy, realized he was best in small dosage. Cohan's double role has a disadvantage for one half being a stick in mud, while the other is live wire we expect (and prefer) of this entertainer. Their switching identities is put off beyond our expectation, and patience; since this is how all twin plots proceed, why not get on with it? Most filmgoers had never seen Cohan live, and so paid admissions on faith that he was B'way's brightest light that would lay them in aisles. The fact he doesn't can be laid on the double act where gentleman George saps energy off fun-lover Cohan of stage repute. If anything slows down The Phantom President, it is focus on his staid side --- audiences couldn't be blamed for wondering if this was the real Cohan. Cohan by most accounts was a pill on the set, irked that he didn't write songs assigned to Rodgers and Hart, them representing progress way past tunes George M. long ago composed. 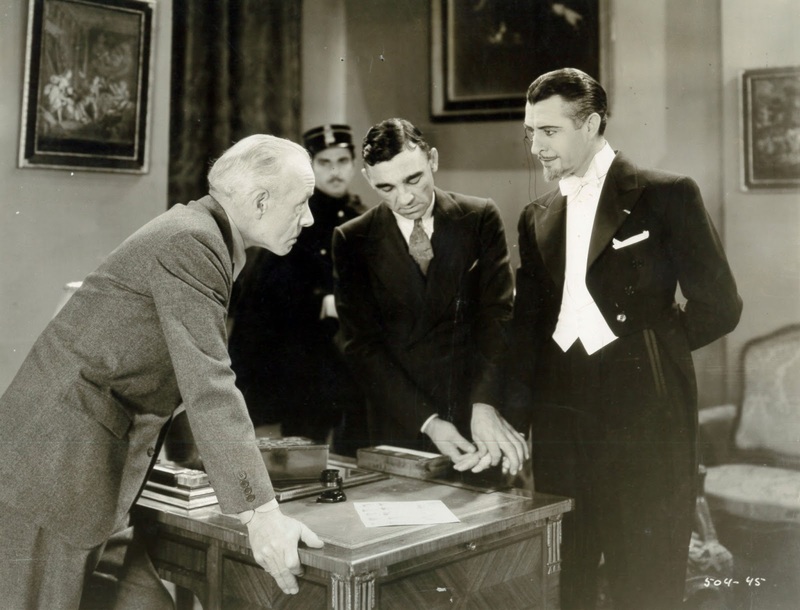 President's director Norman Taurog told interviewing Leonard Maltin that he "liked" Cohan, but the star "felt hampered ... because he didn't know this (movie) business." 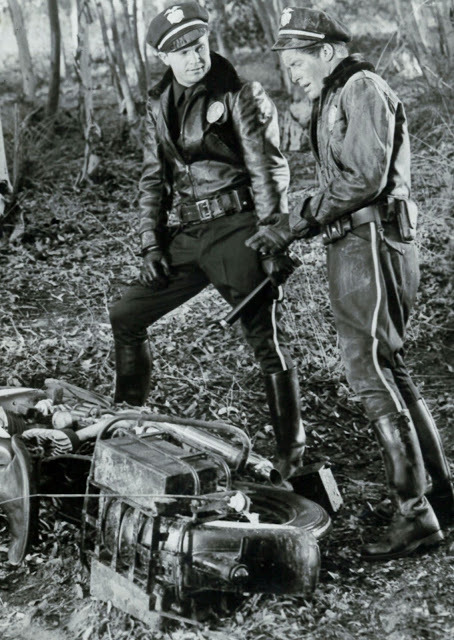 Emphasis on Durante "just killed" Cohan, said Taurog, but the director kept a lid on the disparate personalities by not siding with either, and getting along with both. 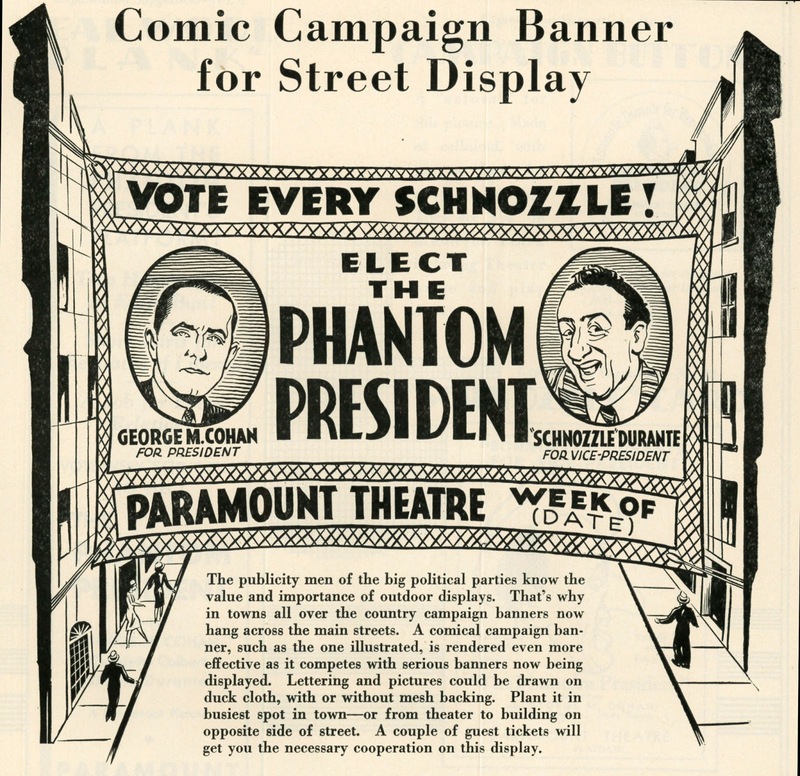 The Phantom President was an election year release, so traded on news related to real-life campaigns. 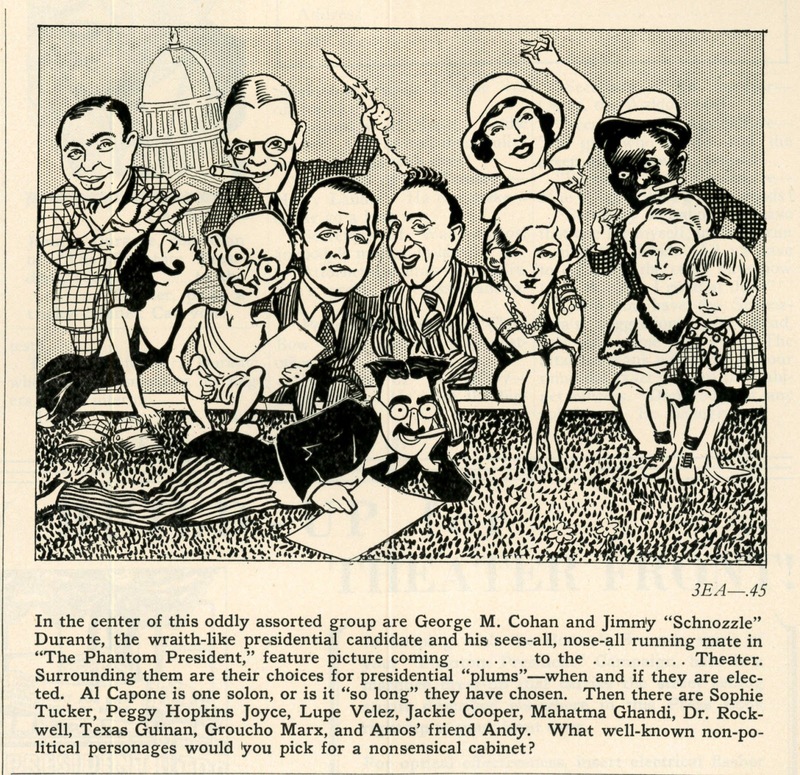 Patronage could plug in candidates to either side of Cohan's dual act --- was stuffy George M. a take on Hoover, his buoyant half reflective of challenger Roosevelt? 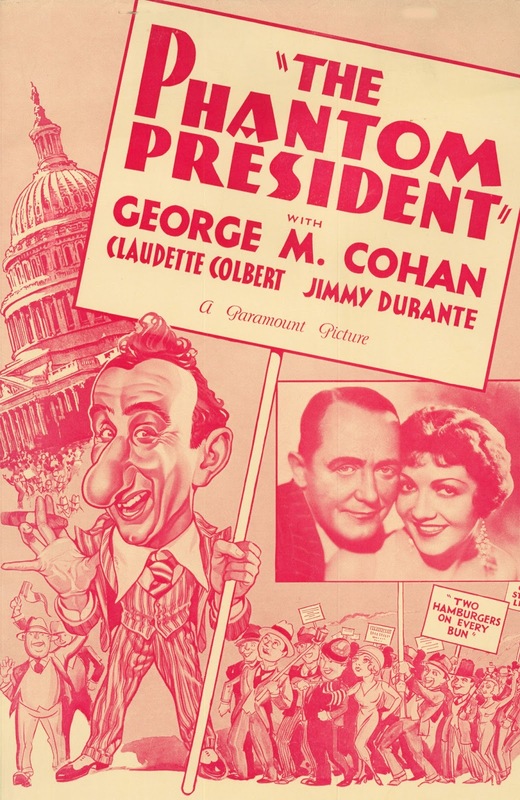 Cohan as faux "Theodore K. Blair" (he's really medicine show performer "Doc" Varney) says that presidential bids should be conducted like musical comedy, a quote many at the time would have seen as prophetic, especially with radio increasingly a device used to promote candidates. The Phantom President broke the Paramount Theatre's attendance for an opener week in October 1932, but this was Broadway, where George M. Cohan's name still loomed large among legit-goers. 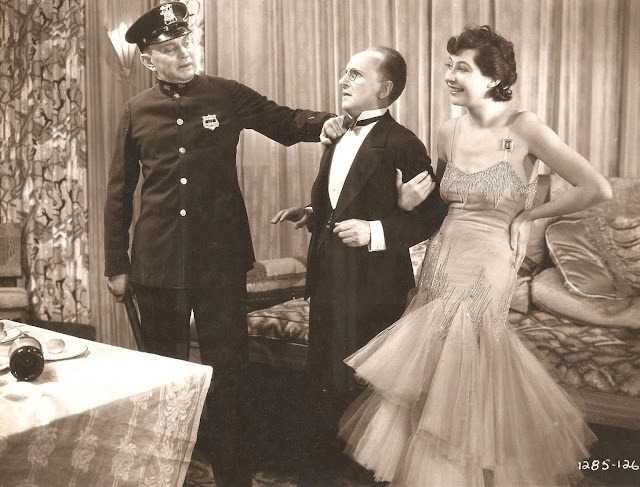 For stix-dwellers, it was Durante who'd sell the show, ads weighted his way to such extent that I wonder if Cohan complained, assuming he noticed. Billing was small comfort: Sure, Cohan came first per contract, Claudette Colbert as lead lady second, then Durante, but art belonged to Jimmy, his face and "schnozzle" so dominant as to make him seem the sole star on view. 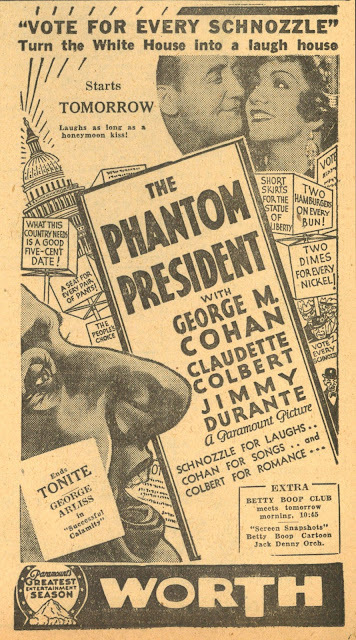 Trouble then for The Phantom President was Cohan being much less known to middle-America, let alone the Southeast, and what he exhibited on screen didn't excite much interest. It was like repeat of what Paramount experienced with their "Famous Players In Famous Plays" policy back in the teens, stage names overpaid to work magic in films, only film customers didn't find them so magical. Also an anchor was most engagements of The Phantom President playing off after Election Day, excitement and suspense of the vote dissipated and folks back to normal routine. The Phantom President took $520K in domestic rentals, not a disaster, but also not enough to encourage more Para ventures for Cohan. Goes w/o saying, I suppose, that there is no authorized DVD or streaming, and probably won't be so long as we're on this side of the Veil, but bootlegs exist, a few OK given patient search and locate (HOLD EVERYTHING! Universal Vault has just released The Phantom President on DVD). A good movie and greater curiosity for those who'd like seeing what the real Yankee Doodle Dandy was like.